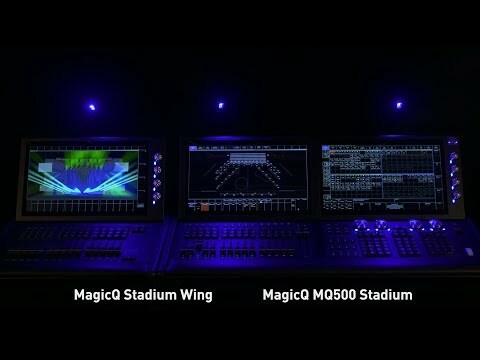 The MagicQ MQ500 Stadium is a new control console from ChamSys designed to operate at the highest level of show control. MagicQ MQ500 Stadium enables shows to be designed from concept to reality including lighting, media, LED and scenic design. The MQ500 Stadium features dual multi touch displays in full HD with adjustable viewing angle and gesture support. The MQ500 Stadium has inbuilt MagicVis 3D visualiser with high quality beam and gobo rendering. The MQ500 Stadium supports up to 102,400 parameters onboard and 200 universes direct from the console without the need for external processing. MagicHD media server runs on board enabling pixelmapping to all 200 universes. The MQ500 includes an intensity wheel and 100mm split crossfaders for theatre control, and incorporates 42 fader and executor playbacks for live busking. The MQ500 uses a 12v Sealed Lead Acid Battery.